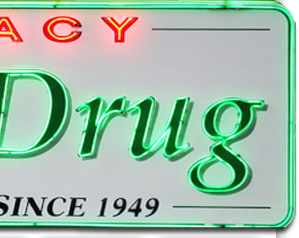 Gaddy Drug was founded in 1949 by Marion and Dora Gaddy. Marion Gaddy became a pharmacist as a second career prompted by his brother Ray (Hi). After completing his training, Marion worked for Purity Drug in Muskogee. He was then employed by Cecil Duberry of Duberry Drug where he worked as a pharmacist for several years. In 1949 Marion and Dora purchased Duberry Drug from the Duberry's. There would be other Duberry Drug stores to follow that Cecil owned, but this Duberry Drug Store was the beginning of Gaddy Drug and the long history in Muskogee. Marion changed the name to Gaddy Drug not long after the purchase. The store was originally located where the Muskogee Public Library sits today 809 W. Okmulgee. The Gaddys gave the store a major facelift in 1959 including a new soda fountain and expanded inventory. The store was open from 8am until 11pm with a pharmacist on duty, typically Marion Gaddy, Windle Thompson or Mack Palmer. 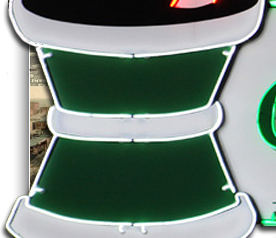 About the time the store was being upgraded, Jim Egan and Ole Weddle formed a partnership to build a new shopping center in Muskogee known as Broadway Shopping Center. In 1960 at the pair's prompting Marion agreed to move his newly remodeled store. So it was in August of 1960 Marion packed up Gaddy Drug and moved to its home of more than 60 years, 1126 West Broadway. In 1961 Mr. and Mrs. Marion Gaddy were involved in a fatal car accident. During the years following the accident Hi Gaddy and Aunt Irene ran the day to day operations of the store. The Gaddy's had one son, Robert, who completed pharmacy school at the University of Oklahoma in 1972. Robert took over all responsibilities of the store this same year. He owned and ran the store for over 3 decades. 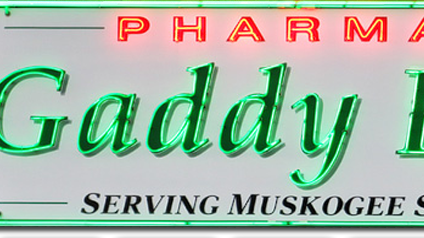 For 33 years Mr. Robert Gaddy served the community of Muskogee at Gaddy Drug. In 2005, Robert, ready to retire, sold the store to Dave and Michelle Carter. Dave and Michelle, native to Oklahoma, relocated from Springfield, MO back to their Oklahoma roots. The Carters attended pharmacy school in Weatherford, Oklahoma from 1993-1997 earning a Bachelors in Pharmacy. They received their Doctor of Pharmacy from the University of Kansas in 2004. The store continues to be run with the mom and pop mindset from years gone by. We love Gaddy Drug and the community that surrounds it. Thanks to everyone who continues to support small businesses with rich histories like this one.